While the hundreds of people who died off the coast of Lampedusa are granted post mortem Italian citizenship, public prosecutors are planning to charge the survivors with ‘illegal migration’. In an excellent article published in El País on 5 October entitled “Only the Dead Can Stay", Pablo Ordaz explains how this absurd situation was made possible by the criminalization of illegal migration in Italian law. To make matters worse, Ordaz reported that the authorities initially refused to help local fishermen in their efforts to rescue people. A local fisherman, who arrived first at the site of the accident, said that coastguard officers wasted time filming the rescue operation. He told reporters that "They refused to take on board some people we'd already saved because they said protocol forbade it" (see here). As Ordaz points out, Italian authorities actually have the right to stop people who want to rescue migrants at sea since ‘complicity with illegal migration’ was criminalized in 2002 by the Berlusconi government thanks to the pressure by the xenophobic Lega Nord party. More generally, this shows the dangers of criminalizing migration, which has been a trend in several European countries. 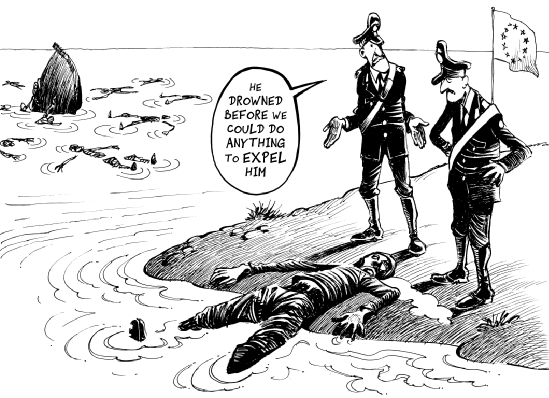 Instead of solving a problem, criminalizing migration has made matters worse, as it increased the risks that migrants and refugees have to take and their dependence on smuggling, and it decreases the chances of getting rescued if they find themselves in perilous situations because people are afraid to get prosecuted for assisting 'illegal migrants'. Deeply embarrassed by the Lampedusa tragedy and the concomitant media attention, Italian lawmakers announced they want to amend immigration laws by withdrawing elements that criminalize irregular migration. However, given their past track record, it remains to be seen how long Italian and other European politicians will be able to resist the perverse temptation to be ‘tough on immigration'. People smuggling is a reaction to border controls, not the cause of migration. Lampedusa shows us the sad state of affairs after 20 years of 'fighting' a delusional migrant 'invasion'. Several studies have shown that increasing border controls have not stopped but rather diverted trans-Saharan and trans-Mediterranean migration routes, as they have done elsewhere in the world. Border controls have forced migrants and refugees to travel along more dangerous routes and have made them dependent on smugglers, who facilitate border crossings. Even stricter border controls will boost the profits smugglers can make and will cause more migrants and refugees to risk their lives on perilous, long crossings on unseaworthy boats. Third, with regards to irregular labour migration: If European governments are genuinely concerned about the exploitation of irregular migrant workers in European workplaces, they should create more legal channels for lower skilled migrant labour for which a real demand exists (as recently argued by EU Home Affairs Commissioner Cecilia Malström), to regulate labour markets and target employers who abuse migrants' irregular status instead of criminalizing migrants. Fourth, this means that European governments should stop encouraging North African countries such as Morocco and Libya to flagrantly abuse migrant and refugee rights, as they have done over the past two decades. This includes suspending most programs for so-called 'assisted voluntary return' which may be well-intended but often serve to justify the violation of migrant rights by North African governments. These policies have not only caused widespread suffering, but have only encourage migrants and refugees who initially considered these countries as destinations, to move on to Europe. This would signify a radical break with the past years, in which European leaders have done their very best to abuse 'migrant tragedies' such as in Lampedusa to create a 'myth of invasion'. For instance, in 2011, Italian Foreign Minister Franco Frattini warned that Europe may suffer an influx of many as 800,000 refugees if the Ghaddafi regime would fall. Some politicians even predicted that up to 1.5 million Africa migrants would come to Europe as a consequence of the Libyan conflict. Eventually, only a few thousands of refugees arrived in Europe as a consequence of the Libyan conflict, as most preferred to return home. While organisations such as Frontex have a clear material interest in inflating the 'invasion' myth, for national politicians creating such an 'external enemy' can be an effective strategy to deflect attention away from thorny domestic issues. Recycling of this misleading ‘myth of invasion’ may be politically convenient but undermines popular support for sensible policy reforms that will guarantee the protection of migrant and refugee rights on the European borders. European policy making on this issue is caught up in a vicious circle of 'tougher border controls -> higher risks of migrating -> more dependence on smuggling -> more deaths --> tougher border controls, and so on. This is a dead end. Excellent! Such a relief to read someone (anyone) writing with knowledge and intelligence about our dysfunctional immigration regime. Thank you for this clear and sober article. Hopefully, at today's meeting of European ministers in Luxembourg, the decision makers began to realise the need to shift the focus of migration policy away from the concept of 'people breaking the law', and to concentrate instead on the laws that are breaking the people(s). Really agree with this, I put forward similar points in a post entitled 'Knocking on Europe's door' at http://universitydiary.wordpress.com/ in case you are interested.. Interesting and sharp. I have also earlier linked to another one of your blog posts about the film Africa Paradis. I wrote among other things about that movie too on my own weblog earlier today. You find my weblog Swedish heart and soul on www.andersmoberg676.wordpress.com. In just 11 eleven months it has attracted readers in 101 countries worldwide. You have a good blog. Those people are desperate, no doubt of it. Their living conditions are miserable, no doubt of it. However, there is not enough room for all of them in the Europe, if the Europe is to be Europe we used to know, and not to turn into a mini-Africa with all the problems of the original. You're concerned with their lives, their rights, their living conditions, their well-being. That's understandable. But what about us, the autochtonous inhabitants? Do we have no say in this? What about our rights? What about our well-being? What about our way of life? This land is ours, we inherited it from our forefathers, why should we share it with uninvited people, no matter how desperate? They're coming to our land and expecting us to change our way of life to accomodate theirs; they're bringing their trouble with them and expecting us to solve it for them, to share the fruit of our work, to take care of their jobless, sick and elderly, while bringing us nothing in return. And yet, don't we have our own trouble to solve? Don't we have our own jobless, sick and elderly to care for? Don't we have our own homeless to shelter? Escaping from a troubled country may be a hard decision, but it is easy compared to putting your life at stake to make your country a better place; our forefathers didn't escape, they stood and fought, and whatever we have now is their deserving, their merit. We are here, today, only because they stood and fought. And it should be remembered that they stood and fought to keep people like this out, to save this land for us and our children. Now, we are supposed to give the very same land away, just like that? To share it with strangers, with uninvited guests? I am sorry for the migrants' plight, but still, I think we shouldn't let them in; that helping them will cause us harm, because they are not bringing us anything positive, anything we could benefit from... they're only bringing us more trouble, and more hungry mouths to feed. Please, if you can, persuade me I'm wrong. I completely agree with Pavel. This blog here persistently tries to provide solutions which are not possible. Europe cannot be that liberal, and anyway migrants will sooner or later find out that their life in Europe will not be as shining as they thought. Their movement in Europe under such circumstances is very likely to lead to "modern slavery". Yes we need to change the circumstances, the roots! But we need selection. Europe must select its people who come in so that the development of the migrant is achieved as well as Europe's development. Europe cannot open its borders nor welcome anyone that wants to move to Europe. Health issues, security issues and even cultural issues will be at risk! I agree that open borders is a solution in fighting smuggler's activity (for the simple reason that there will not be demand for smuggling services) but I disagree with the argument that it wont substantially change the magnitude of such migration flows. I think it will! and as Pavel says; who are we (Europe in general, being in Crisis) to provide our services to a large amount of population which part of it may be a threat to Europe's stability, social cohesion and even growth. We saw many times in France or Itally problems with gipsies or other such groups which did harm development. It is nice to praise this article and talk about "human rights", "universal declarations" and "laws that protect migrants but Europe ignores that..." But it is more important to keep our feet on the ground and see the situation more realistically! I find this blog interesting and I was happy to see Pavel's comment because he makes a valid point and makes this blog more interesting! Internet is about discussion and discussion is meaningless without confrontation. I hope Hein de Haas can reply. Thank you Hein. Have you ever been to Lampedusa? I lived there two months last summer and it is incredible to see how many of the 'politically engaged' people on the island express just the same ideas on the matter. It is also incredible to see how - even there - the mainstream discourse that you so well outlined lets the rest of the people keep on thinking the government way. This is a stunning lucid analysis. Keep on going.